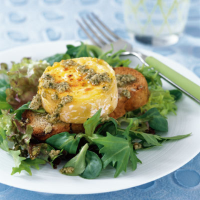 This combination of creamy goat's cheese and nutty salad dressing makes a perfect light meal. Use a bag of prepared salad and it will be ready in minutes. First make the dressing. Place all the ingredients for the dressing in a food processor or liquidiser and blend until well combined. Place in a small pan. Toast the bread on 1 side under a preheated hot grill until lightly browned. Turn the slices over, place a round of goat's cheese on top of each and return to the grill. Reduce the heat and cook for 2-3 minutes until the cheese bubbles, softens and starts to brown. Warm the dressing over a medium heat for 1 minute or until just heated through, whisking occasionally. Divide the salad leaves between 4 plates. Place the toast and cheese on top and drizzle with the warm dressing. Serve immediately. Add a 200g drained tub Waitrose Marinated & Grilled Red & Yellow Peppers (from the chiller cabinet), to the salad. Reserve the oil to make the salad dressing. This recipe was first published in May 2005.